"Hi, my name is Conor. Other than my father being a bit of an eccentric lunatic, my life was pretty normal until I got attacked in my living room and whisked away to Tir na Nog, the mystical land of the ancient Celts, where it turns out Dad is the usurped heir to the throne and everybody wants me dead because of some prophecy. Don't you just hate when that happens?" Shadowmagic is a rip roaring fun fantasy adventure novel by John Lenahan very loosely based on Irish mythology where every chapter ends on the edge of a cliff (or at least a high curb.) Join Conor as he grapples with typical teenage problems like, how to deal with a father's high expectations, how to survive in the world on your own and how to woo a beautiful girl - that wants you dead. 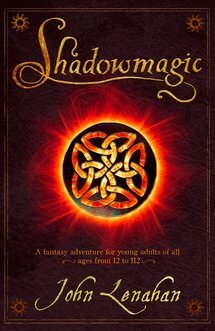 Shadowmagic a podcast novel for young adults from 12 to 112. Rated 10 out of 10 on The Geek Beat! We will send Shadowmagic to your Kindle at . Shadowmagic has been sent successfully to your Kindle!